NOTE: This is an experimental feature that is currently being developed. This example provides an overview of how to enable it and the benefits of using fixed-lag solving. The objective is to provide a near-constant solve time for ever-growing graphs by only recalculating the most recent portion. Think of this as a placeholder, as we develop the solution this tutorial will be updated to demonstrate how that is achieved. The complete code for this example can be found in the fixed-lag branch of RoME: Hexagonal Fixed-Lag Example. Fixed-lag solving is enabled when creating the factor-graph. Users provide a window - the quasi fixed-lag constant (QFL) - which defines how many of the most-recent variables should be calculated. Any other variables are 'frozen'. The objective of this example is to explore providing a near-constant solve time for ever-growing graphs by only recalculating the most recent portion. In the example, the basic Hexagonal 2D is grown to solve 200 variables. The original example is remains the same, i.e. a vehicle is driving around in a hexagon and seeing the same bearing+range landmark as it crosses the starting point. At every 20th variable, a solve is invoked. Rather than use batchSolve(), the solve is performed in parts (construction of Bayes tree, solving the graph) to get performance statistics as the graph grows. # Standard Hexagonal example for totalIterations - solve every iterationsPerSolve iterations. @info "Adding odometry factor between $psym -> $nsym..."
@info "Creating factor between $psym and l1..."
@info "Quasi fixed-lag is enabled (a feature currently in testing)!" # Plot the many iterations to see that it succeeded. Lastly, the timing results of both scenarios are merged into a single DataFrame table, exported to CSV, and a summary graph is shown using GadFly. Preliminary results for the comparison can be seen below. However, this is just a start and we need to perform more testing. At the moment we are working on providing consistent results and further improving performance/flattening the fixed-lag time. 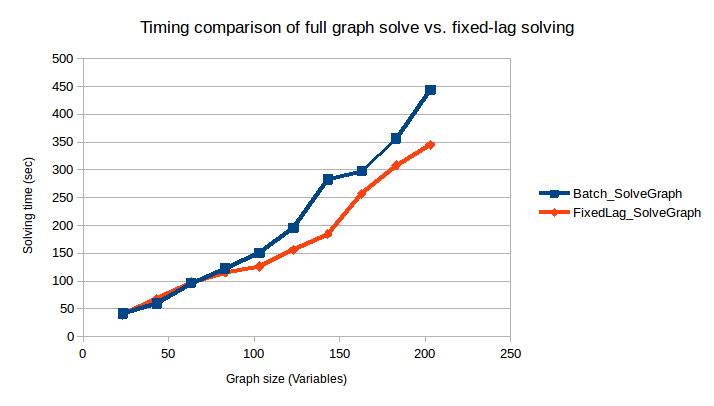 It should be noted that the below graph is not to demonstrate the absolute solve time, but rather the relative behavior of full-graph solve vs. fixed-lag. NOTE Work is underway (aka "Project Tree House") to reduce overhead computations that result in poorer fixed-lag solving times. We expect the fixed-lag performance to improve in the coming months (Written Nov 2018). Please file issues if a deeper discussion is required.